Reino Johansson has extensive management experience working in various positions with PwC, Deloitte Telia and Ericsson. Hogia AB has appointed Reino Johansson as the new Chairman of the Board. He succeeds Jan Rudberg, who is retiring after 20 years. Reino Johansson has extensive management experience working in various positions with PwC, Deloitte Telia and Ericsson. "Hogia was a pioneer in the Swedish software industry. For almost 40 years, the company has managed to adapt to continuous technological development, whilst maintaining good profitability and continued growth. I'm really pleased to be joining Hogia as we move into the future, "says Reino Johansson. "There are interesting synergies between these areas that we will take advantage of. Our knowledge of the transport sector promotes the development of products on the administrative side, and vice versa. For example, Hogia can provide public transport passengers with real-time information. 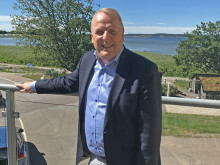 Within the administrative side, there is focus on real-time applications in order to get an up-to-date picture of its financial status, and there we will be at the forefront”, says Reino Johansson. "With Reino Johansson's appointment, we continue the tradition of having people with extensive experience in leading and developing complex businesses on the board of Hogia," says Bert-Inge Hogsved, Founder and CEO at Hogia. The Hogia Group comprises 27 companies in Scandinavia and the United Kingdom with a total of 600 employees. With software as a common denominator, the Hogia Group currently operates in three business areas: finance and business systems, human resource systems, and transport systems. For more information visit www.hogia.com..